Skin with little hair - such as the nose, edges of the ears, thighs and belly - is sensitive to sunburn. It is worth considering putting special sun cream for dogs on these parts of your dog. By regularly brushing your dog, you can remove loose hairs and thin out the undercoat. This makes it easier for the dog to lose some of its body heat. Some dogs may benefit from a trim. If you would like to trim your dog, it is best to ask a groomer for advice. When you prefer to take care of your dog's coat yourself then you can easily do this by using one of Furminator's premium combs for dogs. In tropical temperatures, people are often advised to restrict non-essential physical exercise, such as playing sports. The same also applies to dogs. In hot weather, do not allow your dog to run alongside your bicycle and do not go for long walks. Try not to plan the walks at the hottest time of day, and instead walk your dog early in the morning or late at night. Do not stimulate exertion either, so leave the ball at home and don't pick up that stick. Asphalt and sand heat up quickly in the sun and can become scolding hot. Everyone who has been to the beach knows how this feels. Dogs experience the same thing. Asphalt can heat up to over 50 degrees in the sun at a temperature of 25 degrees. In tropical temperatures of over 30 degrees, the temperature of asphalt can even rise to over 60 degrees. If you take your dog for a walk, you should avoid asphalt in full sun and walk on the grass instead. If the ground is too hot to put your hand on it, then it is not suitable for your dog to walk on either. In tropical temperatures, it is important to take the necessary precautions in and around the house. Do not let your dog lie in the sun for too long, even when it chooses to do so. If you have a sunny garden, you should create plenty of shaded areas using a parasol or ensure that your dog can access a cool barn, shed or garage. Provide plenty of drinking water at room temperature, do not give your pet ice cold water. Finally, there are various products available for you to provide your dog with extra refreshment, such as a special dog cooling mat, dog cooling collar or cooling jacket for dogs. Unfortunately it is still necessary to make people aware of this risk. Every year there are reports of dogs being saved from cars at the last minute. People underestimate how quickly temperatures can rise in a (closed) car. It does not have to be very hot for the temperature in a car to increase to a dangerous level within a short time. When it is 24 degrees outside, the temperature in your car will increase to 34 degrees within 10 minutes and to 43 degrees within half an hour. Even when you leave a window open or park in the shade, the temperature can still rise dramatically! Just popping into a shop can have fatal consequences. Like humans, there are also risk groups among dogs that are extra sensitive to heat. These mainly include older dogs and puppies, overweight dogs and dogs with short noses including Bulldogs, Boxers and Pugs. These breeds run a higher risk of overheating because they are not able to release their body heat as effectively by panting. Dogs with a dark and/or thick coat are also extra sensitive to the heat. In hot weather, it is lovely to visit a beach or bathing lake. However, do make sure that dogs are allowed first. Beaches in particular often restrict access to dogs (off the leash) in the summer months. If you bring your dog, please make sure that you can create shade, with a parasol or a beach tent for example. Also bring a rug so that your dog doesn't have to lie down on the hot sand. 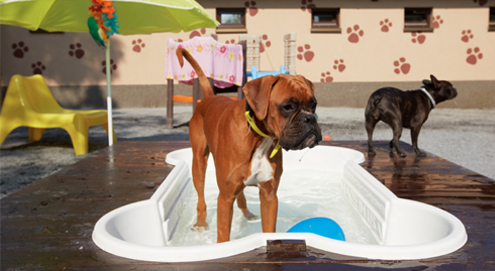 Swimming is a great (and often fun) way for your dog to cool down, but beware! Whilst swimming, especially with a ball, dogs often swallow a lot of water without noticing. Even in fresh water, this can lead to problems, but you have to be especially careful if your dog is swimming in the sea. Dogs can develop serious gastrointestinal problems as a result. That is why it is important to bring plenty of lukewarm drinking water for your pet! The Popware Travel Cup is a handy, collapsible food and drinking bowl for travel, and the H2O4K9 is a drinking bottle and a drinking bowl in one. Bathing ponds are generally full of stagnant water. In combination with a temperature between 20 and 30 degrees, blue-green algae can occur. This is a toxic water bacteria for humans and animals. When contaminated water is taken in through the mouth, this may lead to problems including gastrointestinal conditions, skin rashes and irritation of the mucous membranes. Warm weather also brings a risk of botulism. The bacteria (Clostridium botulinum) that causes this occur in the gastrointestinal tracts of birds and fish. When birds and fish die and end up in stagnant water at higher temperatures, the water can be infected with the toxins of the bacteria. Dogs get sick by swimming in or drinking this water. Botulism in dogs can lead to severe gastrointestinal problems, muscle weakness, paralysis and ultimately death. That is why you should ensure that the water is safe before allowing your dog to swim in it. What to do if your dog overheats? Overheating in dogs can be recognised by the following symptoms: heavy panting, lethargy, feeling warm (temperature above 39 degrees). Sometimes your dog might start vomiting and drooling excessively. Take your dog to a shaded area as quickly as possible and cool the dog down by wetting it and placing wet towels over its belly, where the coat is thin. Please note: do not cover the whole dog with wet towels, as this will stop the dog from releasing its body heat. If possible, let the dog swim or lie in the water. Give your dog small amounts of lukewarm water to drink and contact your veterinarian as soon as possible! Do you have any more questions about dealing with heat or overheating? Please contact our veterinarian via e-mail at: veterinarian@vetsend.co.uk. Handy drinking bottle to use on the road.